What is the Insiders Movement about? Dr. Reagan and I on our ministry's television show Christ in Prophecy had the pleasure of asking this question of Eric Barger of Take a Stand! Ministries. Eric is an authority on the cults, the New Age, and rock music today. From his past as a former drug addict and rock n' roll musician who was deeply involved in the New Age movement, Eric has emerged since he gave his life to Jesus Christ to become a great defender of Christianity in America. 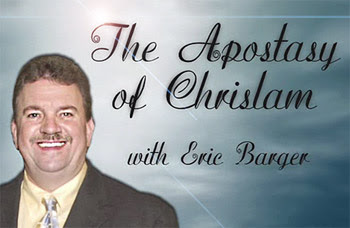 He joined us to talk about the Church's newest apostasy of adopting Chrislam. Dr. Reagan: You mentioned to me in a previous conversation something about the Insiders Movement. What in the world is that? Eric Barger: The Insiders Movement is a movement inside Islam that says if you come to faith in Jesus while you're a Muslim you should just stay there. It is too much trouble to give up Islam as you'll lose your family and surely you might lose your life. Don't stand against Islam from inside it. Just stay there, perform the Five Pillars of Islam, make the five prayers per day, keep reading the Qu'ran, go to the mosque, and listen to the teachings of the imam. But, where then for a Christian is coming out from among them and being separate, that's the problem? Dr. Reagan: That's like saying I know that you're worshipping Baal and you can go ahead with that idolatry, just have Jesus as one of your many gods. Eric Barger: That's really what it comes down to. Tragically, there are people all throughout Christianity including some who claim to be evangelicals who are advocating this kind of apostasy. There are books that have been written that are helping to substantiate the idea of the Insiders Movement. Dr. Reagan: One thing that people don't understand about Islam is the principle of abrogation. The Qu'ran was written over a long period of time. The very earliest statements in there about Christians and Jews are very positive. Christians are called the People of the Book, and Muslims initially were told that they should seek unity with them. Later on, when the Christians didn't accept what Mohammed had said, then he all of the sudden had new revelations from God that he was to kill and subdue these people. Abrogation means that Mohammed's newer revelations override his earlier revelations. The principle of abrogation cannot be found in God's Word. After all, according to the Bible God doesn't change His mind. But, in the Qu'ran, Allah changes his mind. I've noticed in Western cultures like America when Muslims quote the Qu'ran they quote the early scriptures which have been abrogated, and they know that, but when they get into control they suddenly switch the scriptures that talk about putting Allah's enemies under subjection. Nathan Jones: What do these Christian leaders who want to join with Islam do with verses like Surah 9:5, a surah being the Qu'ran's verse and chapter, "So when the sacred months have passed away, then slay the idolaters wherever you find them. Take them captives and besiege them and lie and wait for them in every ambush." Or, how about Surah 2:191-193? "Kill them wherever you find them." Then, if you go to the Hadith, which is the collection of Mohammed's sayings, "And the last Imam would come not unless the Muslims will fight against the Jews. And the Muslims will kill them until the Jews would hide themselves behind a stone or a tree and the stone or tree would say, 'Muslim, or the servant of Allah, there is a Jew behind me, come and kill him'" What do these Chrislam supporters do with these verses? These Koranic verses are teaching Muslims to just outright kill everybody unless they're a Muslim. Eric Barger: There are a lot of Koranic verses especially that speak about slaying those who stand against Islam, and that's stated over and over again. There are also punishments for infidels like the cutting off of the right hand and the left foot as one of the punishments, and then of course there's execution. Killing infidels is the kind of horror that the Qu'ran teaches. Let's go back to what Surah 4 states, which is a great example of Islam's view of other religions. The Qu'ran as it was written began to be compiled 18 years after Mohammed's death. So, it wasn't Mohammed actually writing it, but his followers wrote down what he taught his followers. It says in Surah 4, "O, people of the book." That's a term talking about Christians. "Commit no excesses in your religion, nor say of Allah but the truth. Christ Jesus the son of Mary was no more than an apostle of Allah and his word which he bestowed on Mary in a spirit proceeding from him." It also says, "So say not Trinity, detest for it will be better for you. For Allah is one Allah, glory be to him above having a son." Surah 4 says clearly Allah didn't have a son. A religion that denies the sonship of Jesus Christ to Father God, this is not a religion that Christians can join hands with. When we have people like at the Yale Divinity School who we've talked about who are reaching out to Muslims, they base their premise in a paper that they wrote and that many high profile Christian leaders have signed. They base their premise on the idea that we all worship the same God. If we do, then our God is a very confused God who has said one thing to one people and another thing to another people. Dr. Reagan: So, the god of the Qu'ran is not the God of the Bible? Dr. Reagan: Point blank. I mean, he's just not. Anyone who thinks Allah is Jehovah God is deceived. Eric Barger: Yes, I'm afraid so, that's exactly right. And yet, we have Christian leaders all around us saying, "Oh, it's not that big a deal. It's for world peace." That's going to be the cry of the end times, "It's for world peace." Dr. Reagan: But, in the end, this call will be the damnation of people's souls. Eric Barger: All we do is assure that Muslims who themselves are listening to Chrislam, or people who get involved in the Insiders Movement which is really Chrislam inside of Christian circles, all we are assuring is that they're going to have a convolution understanding of who God is and never have a clear picture of salvation through the blood of Jesus. In the fourth segment of this series with Eric Barger on Chrislam, we will discuss more in depth the Yale Divinity School dialogue. Doesn't the bible say they will call 'Peace,peace' and sudden destruction will be upon them? So for the sake of peace and not the Truth od God we lose. And our salvation now void brings death eternal. What are they doing? Do they not know the scripture?